She was born January 27, 1997, on a cold Winter's day... She always did love the cold. 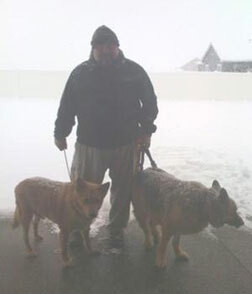 After my divorce in 1995, I lost my two beloved German Shepherds Rynkon & Britta to my ex-husband because I couldn't care for them properly. If they would have had a puppy girl, she would have looked just like my beautiful Zynfyndel, and thus began our special bond and journey that would last just over a dozen years? She was a quite a traveler, she loved road trips and just hanging out in the Mini Van, even when it was just parked on the driveway. She moved with us many many times in her short life? From Sonoma, CA to Dana Point, CA to Orange, CA to Greentown, PA to Creston, CA to Newport Beach, CA to Fallbrook, CA with occasional trips to Las Vegas, NV to Post Falls, ID where her journey in this world would end on the last, sunny, but cold, Winter's day in 2009, on March 19th at 3:35 PM. She was my little girl, my baby girl, my Mama's girl, and I loved her like no other German Shepherd I've ever loved, because of who she was: Kind, Strong, Sweet, Brave, Protective, Loving, Playful, and Fiercely Loyal. She looked fierce, too. But she wasn't. She loved kids. Couldn't stop that big tail from wagging like crazy if kids were around, even if they were ignoring her. One of her favorite games as a puppy with her Dad was to do the ?Tooth Dance.? She always had great big K-9 incisors - nearly every vet she ever saw commented on how long those big teeth were that grew past her bottom gums - her Dad would grab them sing to her and open her mouth to get her ready for me to do her regular teeth brushing. And our Zyn she had her stubborn streak to be sure; Zynnie preferred her Daddy to me and my overbearing hugs around her furry neck... She'd give him that ?help me? look over my shoulder whenever I went in for a big bear hug with her! And I had to pay for her reluctant kisses :) too? usually by distracting her with treats? But my sister only had to show up and Zynnie, just lit up with puppy-like energy each and every time she saw her, and Zyn wouldn't stop kissing her or wanting to jump on her well into her senior years, many years AFTER she stopped jumping on anyone or anything else. I would joke with my baby-girl and say she didn't REALLY love me, but I always knew she did. She had her own cat, Chester, from when she was five months old. Chester loved her dearly and spent lots of time star-fishing or kneading her soft belly and sleeping with her curled up by her tummy and her front armpit; and when he was a baby, she would carry him around in her mouth like her pup. After her death, Chester took on some of her beloved personality traits like begging for food when we eat for one. Never did it before and I've never known a cat that did (and I've had over 25 cats!!!). When I had to go to work when she was 11 months old we adopted Kenwood, our Woofie, so she would have a big brother, he was about five months older and an escape artist who would and could eat anything? Our Houdini-Goat Dog!! And they almost caught a skunk together one December night in 1998 playing in the yard after dark. They were inseparable and best buds, together to the very last moments of Zyn?s life. Although we rescued two other dogs one, a young GSD puppy Kenya, when Zyn was just 14 months old, she never took to females and when Kenya or YaYa as we called her, got to be around five years old, and bigger than Zyn she tried to kill our Zyn by thrashing her by the neck on the driveway pavement. By divine intervention, Zyn stayed absolutely calm and didn't react or get more than a few scrapes on her nose. But poor Kenya had to be given to the shelter along with our other female Scrappy who also tried to attack Zyn as she got older. When she was young and we lived in one home with 17 fruit-bearing, 50-year-old avocado trees (where the branches hung low and heavy with avocados each year), she would "hup" for the avocados to help us pick them and every now and then snack on one herself. She loved all animals, but especially bunnies, and was the best Momma-Dog ever when our bunny had babies but abandoned them. We tried to save them by hand-feeding them. Zyn would nuzzle and lick each of them a little bit after I fed them as their fur grew in, she was so gentle and caring as if she truly was their mom. When our Zynnie was three years old we got a Cherry-Headed Conure that she just loved Razzleberry. When he was young, she loved to kiss the top of his head, and I would say ?Kiss the Baby, Zyn? and she would! After a few months of this, Raz started saying it himself? ?Kiss the Baby? over and over again, and if she didn't listen to him he would call out (and still does to this day, every day) ?Zynfyndel!? She had to learn to swim when she was nearly twelve years old because she needed to learn to walk again after spinal surgery, and even though it made her shake and tremble with fear, she obeyed and got into the pool for her swim therapy several times a week. She was such a good girl. And although it has been over a year, I am still raw inside and I miss her every day. My tears of sadness continue to fall when I think of her sweet face; soft and silky, long fur; and lovely personality. I love you my Sweet Baby Girl Zyn, I hope it's cold in Heaven for you, honey, you always did love the cold. As the years go by, I still miss you both each and every day Kenwood & Zynfyndel... My beloved babies. Chester is now 15, the age I had hoped you both would see, and Spookie is almost 16. I remember the comfort you both brought to my Mom when she was home sick those last few months. So hard to believe all we've lost in these last ten years. I love you and I am so glad we will all be spending eternity together in Heaven with God and Jesus... When He makes all things new again. Mr. Woofie joined his sister in Heaven on July 23, 2010. One of the most difficult 32 hours of my life. Miss you Kenwood, love you, too. 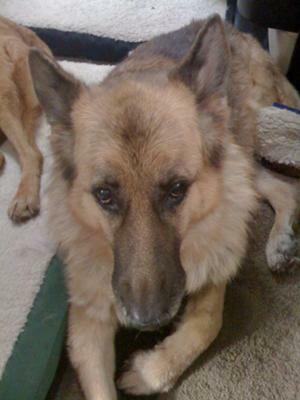 Play nice, nice with Zyn in Heaven until we all are together again... Love you, my boy-dog, Woof. Thank you Debbie for posting my story. To any readers thank you for reading and I am sorry I did not know I could not use quotes or apostropies, and that is the reason for all of the ? marks which makes it a little confusing. To Zynfyndel, I love you forever and I thank God for giving you to us for the time we shared on earth.